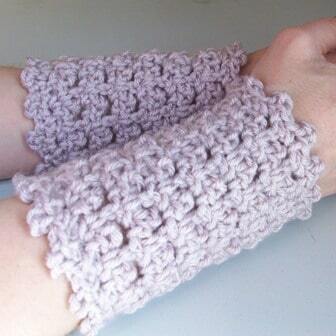 These gorgeous FREE crochet patterns ar offered exclusively by Rhelena of CrochetN’Crafts. 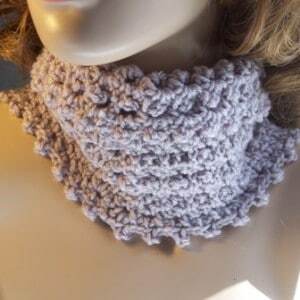 I absolutely love this Picot Cowl and matching Picot Arm Warmer. I hope you do too. Be sure to visit CrochetN’Crafts and its sister site Crochet Pattern Bonanza. Rhelena was recently my featured guest blogger, to read her story click HERE. Yarn: Patons Canadiana or any similar worsted weight yarn. At least one 3.5oz ball for the cowl depending on how large you make it, and one for the arm warmers. Measures 2″ across 3 stitch repeats and over 6 pattern rows. When lying flat the cowl measures 11″ by 6″, however, you can make it any size you want. • This pattern is turned after each round. Ch 70 or any multiple of 2; join with sl st to first ch being careful not to twist chs. Repeat rnds 2 and 3 until you have reached a desired width making sure to end with rnd 2. FO. Chain any multiple of 2 to fit around your arm or wrist and follow the pattern above. I hope you enjoyed these free crochet patterns by Rhelena, to find out more about her and her websites, click HERE!